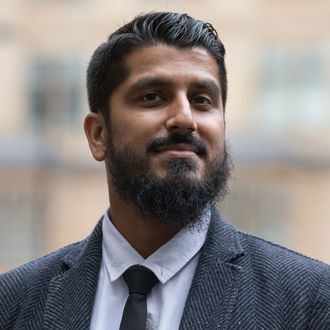 In London today, the director of advocacy group Cage was convicted on terrorism charges because he refused to give airport security the passwords to his electronics. Muhammad Rabbani was convicted of obstructing counterterrorism operations by not ceding access to his laptop and cell phone. Heathrow Airport authorities contend that the stop was lawful, though Rabbani was not charged with any other crime at the time of the inspection. The court handed down a conditional discharge of 12 months, meaning no jail time, and ordered him to pay 620 pounds. On Twitter, Cage announced that Rabbani was considering appealing the decision. Rabbani will today walk out of court with his head held high and welcomed by a crowd of congratulating supporters. In the meantime, the ruling sets a precedent that could have severe consequences for anyone handling sensitive information and traveling into the United Kingdom, where refusal to unlock devices for authorities could lead to prosecution. In the United States, the legality of being forced to provide device passwords when crossing the border is unclear. For local law enforcement, it is generally accepted that one can legally refuse to provide alphanumeric passwords.